The Columbia Series 900 Aluminum Window is a sliding window that offers a life of smooth, quiet operation. This particular window is easy to install and asks for nothing but simple and quick cleaning. 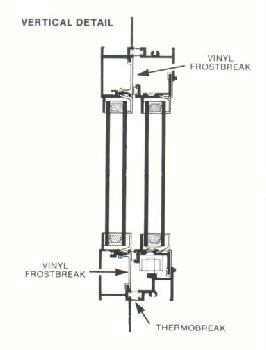 Columbia aluminum thermal break primary windows have versatile design with a large variety of uses, ranging from single dwellings thru multi-family units to institutional and commercial construction. There is no doubt that Columbia has the industry’s finest constructed, most attractive and adaptable aluminum primary window there is to offer. General: All of our Aluminum Thermal Break Series C-900 HS-C20 Sliding (Rolling) Windows shall comply and bear the Quality Certification label in accordance with the ANSI/AAMA Certification Program 101-93. 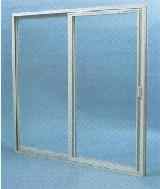 Material: Series C-900 aluminum window frames and sash members shall have a minimum thickness of .062″. Integral fins to have suitable break-off and nailing grooves. Finish: Aluminum windows to be finished in bronze, white or sandstone acrylic electrostastically applied enamel finish. Construction: All joints of frame and sash members shall be neatly fitted, securely connected and permanently watertight. Frames shall have step point construction for maximum rigidity. Both frames and sash members shall use an extruded screw boss that is an integral part of the extruded section. The operating sash shall interlock at both meeting rail and closing jamb. Sash shall roll on self-lubricating ball bearing adjustable rollers, and be easily removable from inside when in open position and not removable when in locked position. Mullions to be furnished as required. Fixed and movable sash glazed drop in type. Weatherstripping: Weatherstripping shall be silicon treated, fungus, mildew and moth resistant high performance poly bond fin seal around the complete perimeter of the movable sash with a permanent poly fin in the middle of the poly pile to minimize air infiltration. Vertical stiles are weatherstripped. The poly pile weatherstripping shall use a poly bond backing to insure against shrinkage..
Hardware: Aluminum windows shall be factory equipped with an automatic lock made of non-corrosive material. Screens: Screens shall be available on all windows and shall be easily installed or removed from inside without removing operating sash. Screen frames shall be aluminum sections securely joined at the corners. Screen cloth shall be 18×16 mesh fiberglass. Installation: All aluminum window frames shall be set in accordance with the manufacturer’s recommendations without springing, forcing or distorting. Head and sill shall be aligned parallel and square with jambs. A non-hardening sealant compatible with aluminum shall be provided by the window erector, and applied in sufficient quantity to provide a water tight seal between window and surrounding construction. Fiberglass or a like insulation shall be installed around all four sides of product to insure a tight seal. Manufacturer assumes no liability for damage by the trades or final cleaning of aluminum.